In a previous article, “Hunger is about more than just food production”, I showed how much more potential we have to feed the world than we commonly think. However, having the potential to do so does not mean that we will do it. Human nature has the habit of fluctuating between its best and its worst. Therefore, whether we will actually feed nine billion is far from done. In this article, I am going to reflect to what it would take to be successful at making it happen. 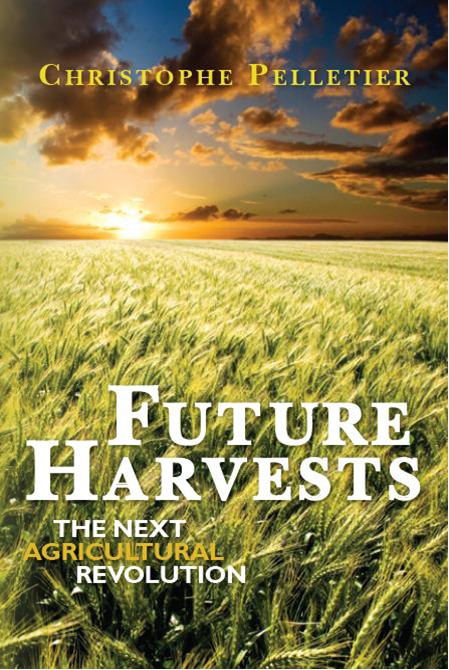 In my book, Future Harvests, I present the six principles that are critical to meet future food demand successfully: Sustainability, Innovation, Market Orientation, Pragmatism, Leadership and Efficiency. I had regrouped these principles under the acronym SIMPLE. While I was writing the book, I always came back to the same observation: success or failure to feed nine billion simply depends on us all. Someone needs to set the course and create the conditions to take the proper actions. The world needs leaders that will make food production potential the reality by 2050. The job description is, interestingly enough, rather reminiscent of food production and genetics. In order to express the full potential of its genes, an organism needs the proper environment. This is exactly the role of the future leaders. They must create the conditions that will allow farmers to produce efficiently, yet sustainably. The starting point will be about making the right decisions for both the long term as for the short term. We must preserve the potential to produce for future generations, but we must not forget to provide for today as well. Proper leadership will need to take into account the interest of many different groups and manage a balanced approach between money, people and environment. For sure, future leadership will be a balancing act. This will be easier to achieve if the leaders can sell the world their plan, which means that they must have one. Leaders come from all layers of society. They are in government, in industry, in non-profit organizations, they are independent farmers, or they come from non-food related occupations. Adequate food supply is the very fundament of societies. Where there is hunger, there is no prosperity. Without food, there is not life, and just as importantly, without water there is no food. Developing food security is not an option; it is probably the most important policy sector of any society. This is something that we must not take lightly, even in rich countries where we seem to take food for granted. Things may change. What story do our leaders need to tell and execute? The points that I raised in the article mentioned at the very beginning are a good place to start. The scandal of food waste, because it really is a scandal, must be dealt with and fixed. In developing countries, this is caused by a lack of infrastructure. It is only a matter of money. If world leaders have the will to get that money at work, it will happen. For some reason, they do not do it. Maybe it is a sign that things are not that critical after all. Compared with the amounts of money thrown at financial bailouts and stimuli of all sorts, the cost of infrastructure development looks ridiculously insignificant. Such projects would actually create jobs and increase the wealth of the populations where it takes place. This would not be artificial GDP boosting, but actual poverty reduction and increased food availability. In rich countries, food waste happens at the consumer end. What leaders of these countries need to communicate is a sense of responsibility. Wasting food is simply immoral, just like any other waste. If we take the example of nitrogen, the waste by leaching is estimated at about half the nitrogen spread on crops. This is huge and very damaging for two reasons. One is that the nitrogen ends up in the drinking water making it harmful, especially for pregnant women and infants. The other is that the production of nitrogen fertilizers uses half the world’s agriculture natural gas consumption. Efficiency is not a luxury, but it is a necessity. When efficiency increases, the amount of waste decreases. This works towards a higher sustainability, too. Food waste is one thing, but food consumption excesses or unbalanced eating habits are another area of work for our leaders. Eating more food than one needs is not only detrimental for that person’s health, it is also food that is less available to others. This pushes food prices up, too. The effectiveness of leaders depends on their ability to communicate and get the message over to their dependants. Changing habits and infusing a sense of solidarity and responsibility requires patience, communication and proper education programs. Defining vague objectives or using hollow populist slogans and expressions will have no effect. Only charismatic leaders with strong convictions about what ensures the future of their people, even if it means sacrifices, will be able to bring such a change. It is not easy to do when your country is not on the verge of a terrible crisis. An interesting example about unilateral leadership is the decision of the Chinese government to slow down the number of new car registrations. They consider that there are enough cars. Getting a licence plate will be difficult in the future. In 2008, they decided to ban the use of disposable plastic bags in supermarkets, thus saving an estimated 100 billion bags and the equivalent of 37 million barrels of oil per year. Similarly, China is now the world leader in renewable energies. What actions did the Western democracies take about new car sales and supermarket plastic bags? When children died because of tainted milk, the Chinese authorities arrested all the people involved, and even executed two persons. Of course, the use of melamine in the milk was intentional, making the case extreme. However, in the West, I do not recall anyone being arrested or considered personally liable after deaths by food poisoning. My point is not to demand imprisonment of CEOs as a standard operating procedure, but I am sure that if executives of food companies felt that they could be personally liable for food poisoning, the precautionary principle would apply much more systematically. Leaders need to make understand that doing something wrong comes with consequences. Although there is much to say about China’s political system, one must admit that not having to think in terms of elections every four years and not having political campaign funded by any industry of NGO of any sort can help politicians focus on the long-term, too. Maybe the fact that China is plagued with so much pollution in the air, in the water and in the soils also makes the issue more acute for the leaders to resolve. If the stick is one option to make people do what is right, the carrot is, at the very least, as important. Nothing stimulates people more than being rewarded for doing a good job. People are at their best when they know that others appreciate what they do, and that what they do makes the world a better place. Then, they do not see their occupations as “have to” activities, but as “want to” ones. Subsidies, bonuses, tax credits are all motivating tools to make people do the better thing, but the key is to have incentives that meet the goals without having harmful side effects. Leaders also need to be innovators. Considering how fast our world changes, and the quantity of new knowledge made available about on a daily basis, many new possibilities will be available to solve old problems. Innovation is the child of human genius and, to cope with future challenges, creativity and adaptability will be major assets. It is the leaders’ role to foster innovation, yet by keeping in mind all long-term implications. The ideal leader would have the qualities described by Plato in “The Republic”. Although it is an ideal, having committed leaders matching his description would increase our odds of success. This entry was posted on Monday, January 24th, 2011 at 2:24 pm and is filed under Agriculture, Economy, Food Security, Leadership, Policies & Politics, Sustainability. You can follow any responses to this entry through the RSS 2.0 feed. Both comments and pings are currently closed.